HighLow are fully regulated broker based in Sydney Australia. Regulated by the Australian Securities and Investment Commission (ASIC). They deliver high payouts and offer a ‘no deposit, no sign up’ binary options demo account – great for beginners, or anyone developing strategies. With a slick trading platform, quick withdrawals, a well though out mobile trading app and full regulation – HighLow offer a great choice of broker for both novice traders, or more advanced trading veterans. Login in to the HighLow website and you will find a unique trading platform. While it provides plenty of the familiar options and features, it also has a look which is specific to HighLow. Tabs at the top of the trading area allow you to select the expiry time. On the left of these is the drop down menu for finding the assets and markets to trade. Below the asset and expiry choices is a ‘favourites’ area, where traders can select their most traded assets. This makes finding the right markets much easier. The main price chart area will update once an asset is selected. It will reflect the latest market prices. It also shows the trader sentiment, payout and the countdown to expiry. There is also a vertical line showing when a trade must be placed by. The trading buttons are on the right of the trading area. You can amend trade size, select the direction of the trade (high or low) – and press the ‘Invest’ button to confirm. Active trades immediately appear in the ‘Open Positions’ window. This sits beneath the price chart. You can select ‘1-click’ trading if desired. This gets rid of the invest button, but creates larger High and Low buttons. These will open a trade immediately in ‘1-click’ mode. 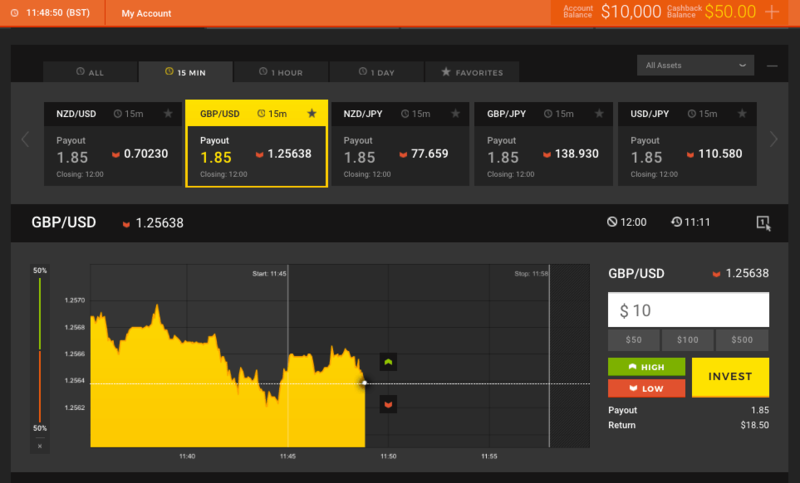 The trading platform is clear and simple to use. The price graph also highlights which direction the markets needs to move in order for a trade to win. This reduces the amount of trader mistakes. The firm use ‘High’ and ‘Low’ on the trading buttons (rather than Up/Down or Call/Put) – which should not be a surprise! A negative of the trading area is the charts. There is little flexibility, features or options for technical analysis. This is a common fault among among binary brokers. Traders keen on technical analysis would be better off using separate charting software such as MT4 (MetaTrader4). The current activity window lists all the active or closed positions. It lists a ‘Sell’ option, and also shows the current ‘expiry payout’. Closed positions show the end result for the trade. The range at HighLow do offer traders some good options. The list of assets is not as extensive as some rival brokers. These are likely to be added to as the brand grows. High/Low – Obviously! These are standard binary options – Decide if the asset value will finish higher or lower than the current strike price. Expiry times of these go from 15 minutes up to ‘End of Day’ expiries. High/Low Spread – Spread options differ in the payout and strike price. The basics remain the same as a standard High/Low trade. Payouts on the ‘spread’ options can reach 200%. You will however, need to make up the spread. So if the current market price on the UK100 is 7384.8 – traders might be presented with 7385.1 to go higher and 7384.5 to go lower. This spread is where the broker makes money – but does mean they can offer higher payouts. Turbo – The same as a standard High / Low option. Turbos however, use very short time frames for expiry. So times range from 30 seconds to 1,3 or 5 minutes. Turbo Spread – Short term versions of the High/Low Spread. Again, short term expiry times of 5 minutes and under – but with higher payouts than standard Turbos. The range of markets to trade include stocks, commodities, indices and forex. The only full category is forex however. Other asset classes lack some depth. The major indices are all there, but commodities in particular are missing one or two popular assets. Anyone only trading major markets will be happy enough, others trading more exotic options might be disappointed. It is however, an area the brand could strengthen. HighLow offer a great range of deposit and withdrawal payment choices. One important note is that all client funds are held in a separate trust fund – i.e. not in the company accounts. The trust is operated by the National Australian Bank (NAB). This is reassuring for traders. The most used deposit methods are credit card, Neteller and wire transfer. All require a $50 minimum deposit. Credit card and Neteller transactions are immediate. Wire transfers will credit accounts the same day, where actioned before 12pm that day (Australian time). In addition, HighLow also offer almost 40 other ways to deposit funds. These include SoFort, PaySafeCard and GiroPay. All methods operate along similar lines (£50 minimum, quick transactions). Withdrawals are a clear strength for HighLow. The terms mirror the deposits with a minimum withdrawal of £50 across all methods. Credit card and Neteller withdrawals are processed immediately – and therefore cannot be cancelled. Wire transfers are processed the same day where requested before 2pm. Banks can take up to 3 days to credit accounts though. There are no fees for withdrawals. There is no daily limit on withdrawals, the full balance can be withdrawn. Free withdrawals and quick processing. All you can ask for.